A monitoring dashboard enables you to easily and effectively monitor all your digital marketing channels and your business performance by combining all your data sources into a single, beautiful dashboard. Monitoring data is essential to successful digital marketing campaigns - whether it's SEO or social media marketing or paid ads. But it's not enough to just track the data: you have to be able to relate it to your business metrics and business targets. Take a look at what a monitoring dashboard entails! What is a monitoring dashboard? A monitoring dashboard is a cloud data analytics monitoring solution that lets you track your performance metrics and easily visualize your data sets. You'll be able to get a high-level view of your metrics or you can drill down and analyze the detail. For digital marketers, it's an excellent way to demonstrate the value of your work to your clients or bosses. Why use a monitoring dashboard? By using a dynamic dashboard that includes your client's relevant marketing KPIs and data sources all in one place, you can quickly explain how your strategies affect your client's bottom line, easily answer questions your clients might have, and reduce ad-hoc querying everyone will have access to the same data. What are the benefits of using a monitoring dashboard? 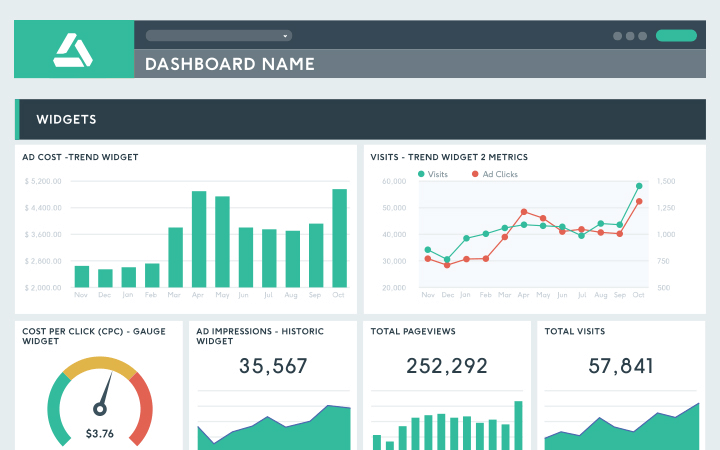 A monitoring dashboard will let you automatically pull data from your digital marketing channels - no need to be a software developer to visualize data or create reports. It also allows your marketing or advertising team to demonstrate your business's tangible benefits and explain to clients what you're doing and why you're doing it. Create your own monitoring dashboard today! What are the best monitoring dashboard KPIs? A monitoring dashboard should include the key performance indicators that give you or your client a good overview of your digital marketing efforts - so try not to overwhelm everyone with too many details. 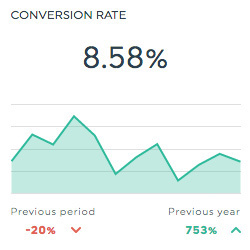 Conversion rate is the number of visitors to your website who take a desired action, like making a purchase, taking a survey, or signing up for a mailing list. 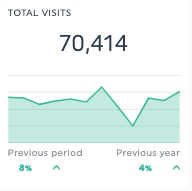 Unique visitors is the number of different people who have visited your website over a given period of time. 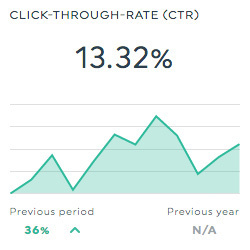 CTR is the percentage of people who are exposed to an ad, or another call to action, and who then click on the ad or call to action in question. 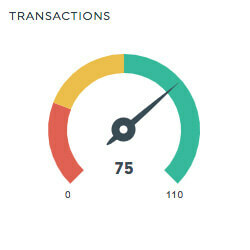 Transactions is the number of times a visitor to your website has made a purchase through your website. What are the top monitoring dashboard metrics? Like KPIs, there are a ton of different metrics you could choose to track using your monitoring dashboard. The best advice is to stick to metrics that give you actionable insights you can use to improve business processes, gain new customers, or improve sales performance issues. This metric tells you the average cost you paid for every time a person clicked on one of your Google ads. This metric tells you whether your ads have been profitable. It's calculated by subtracting costs from revenue, and then dividing by revenue. This metric tells you how often your ad is shown. An impression is counted each time your ad is shown on a search result page or other site on the Google Network. This metric shows the number of times your page’s profile has been viewed by both logged-in and logged-off people. See all these KPIs and metrics in your very own monitoring dashboard! What platforms should a monitoring dashboard include? To make the most of this business tool, an effective dashboard should include all the platforms you're running online marketing efforts on. This will allow you to gauge how all your marketing efforts are interacting with one another so that you can reach your business goals. If you have custom data (from, say, Splunk or Grafana), or historical data you want to use, just upload a CSV file. Whether you choose from among our preselected monitoring dashboard templates, or create your own from scratch; it's all a matter of dragging-and-dropping the KPIs you want! DashThis has the right dashboard for every marketing specialty, depending on the type of data you want to track and for whom. Getting organic traffic to your website is key to a successful business. Make sure your website stays optimized with our SEO dashboard. Digital marketing without measuring, reporting, and analyzing is like flying blind! Get tricks of the trade from our team to create the best monitoring dashboards that your team and your clients can use regularly to create better campaigns and marketing strategies!